In the last tutorial of time and works shortcut formula, we have given you the basic concept, shortcut formula and example question with the solution. The last tutorial was only for basic concept and for the idea of Time and works chapter. But now we are going to discuss the chapter by increasing its level. Because competitive examination is really increasing its level day by day. So now we have to earn the ability to customize the shortcut formula and apply to the question cleverly. We are going to discuss this: how to customize math tricks and apply on the hard question to get the answer easily. One man has completed 1/3 part of a work and he left the work. After then another two men started the work to complete. They can do the work in 20 and 30 days respectively. 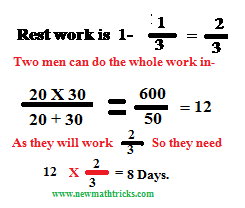 How many days they will take to complete rest work if they work together? Let's suppose the whole work is 1. But in question, ask how many days they will take to finish 2/3 parts of the work. As per the requirement of the question, we just multiply by 2/3 with a value of full working days. Because they need 2/3 times working days of whole working days. So, guys, is not it an easy math trick? Three construction companies can complete a factory in 12, 18 and 24 months respectively. After completion of 1/5 parts of the factory, invited three companies, how long time they will need to complete the factory. Look at the above picture and see that we have used the shortcut formula to retrieve total days to need to complete whole work by three-person or groups of workers. Then we have just multiply by 4/6. Because three companies are working only 4/6 parts of the whole works. We hope that you have understood how to use shortcut formula if we could not use shortcut formula directly. As per question we have to customize the formula or the data to use time and work shortcut formula. Here we are not ending the time and works chapter. We are increasing more levels to prepare well for our upcoming competitive examination. Please visit one by one tutorial to score well in the competitive exam. We hope that you will share with your friends to support our works and your friends.